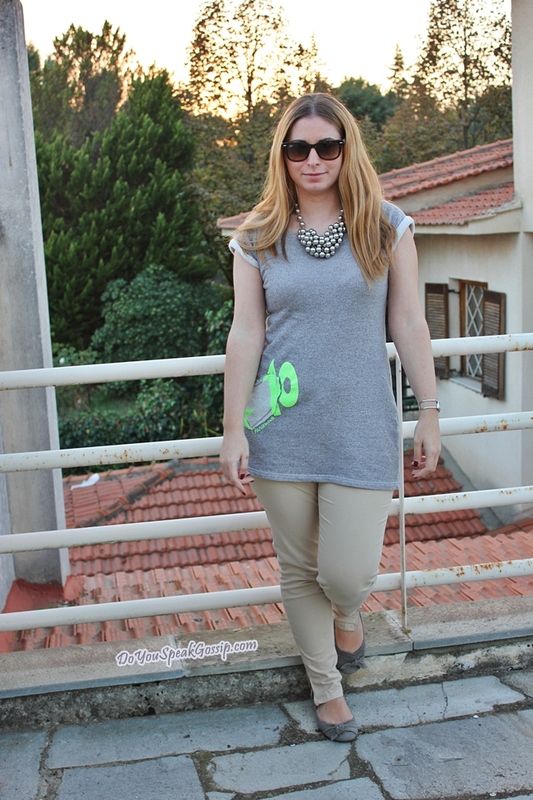 First autumn leaves | Outfit post - Do You Speak Gossip?Do You Speak Gossip? I think the weather is getting colder these days. I could feel it the night I returned home after we had taken these photos! Days are still pretty warm, but when the sun goes down the temperatures drop. My trusty long cardigan couldn’t keep me warm enough. I think it’s finally time to bring out the trench coats and jackets for this season, even here in Greece. This “long summer” has been fun, but it can’t stay forever. These days, I’m dressing really casual. I find this season really tricky. You can’t wear summer clothes, but you can’t wear winter clothes either. I have some fall pieces, but the trickiest part is the shoes for me. Too cold to wear sandals, to warm to wear boots…Usually in these cases, I choose to wear my ballerinas. Top: Paranoia (worn again in this outfit), jeans: Zara, bag: D&G, flats: minelli, sunglasses: Ray-Ban folding wayfarers, necklace: H&M, watch: Esprit. The first fallen leaves are here, to welcome autumn. I’ve saved these flats according to the rules of Shoeper Shoe Challenge, in this post. Καλό σ/κ!!!! Εγώ έχω ήδη πονόλαιμο από χτες… Πάντα Οκτώβριο την πατάω…… Πολλά φιλάκια!!! ΜΟυαρεσει η φλούο λεπτομερεια στην μπλουζα! Lovely colors! I love your cute flats, your interesting t-shirt and lovely cardi! Still in bed – now I started getting soooo bored! Se euxaristw para poli gia ta kala sou logia pantws! Min ksehaseis na mou peis pote mporeis na pame gia kafe na ta poume! πολυ γλυκο φθινοπωρινο λουκ!! μαρεσει το πανωφορι σου! επιτελους δροσιζει ο καιρος αντε να βαλουμε τα χειμωνιατικα μας! S’euxaristw poli ! To fthinopwro kai tin anoixi ntinomai sinithws arketa casual gia dio logous…Prwton, den exw allaxei akoma ta rouxa stin ntoulapa mou, apo kalokairina se xeimwniatika kai to antitheto. Kai deuteron giati pote den kserw ti papoutsia na foresw m’auton ton periergo kairo. Latreuw to casual chic outfit!!! Pragmatika to kolie kanei th diafora kai dinei style! Oh my, I love that top with the necklace! Ωραία ζακέτα και πανέμορφο φθινοπωρινό σκηνικό! Τέλειο το κολιέ και η λεπτομέρεια στη μπλουζα! Μου αρέσει πάρα πολύ το μπλογκ σου! S’euxaristw poli gia ta kala sou logia Eleni! Kalwsirthes sto blog mou! 🙂 euxomai na ta leme sixna. mou aresei poly to kolie k to panteloni! o kairos krywse!wra gia palto k mpoufanakia! Oi apoxrwseis pou exeis epileksei einai apo tis agapimenes mou kai einai poly wraia enallaktiki gia to mayroidiaitera otan o kairos den einai poly kryos! Mia koukla!